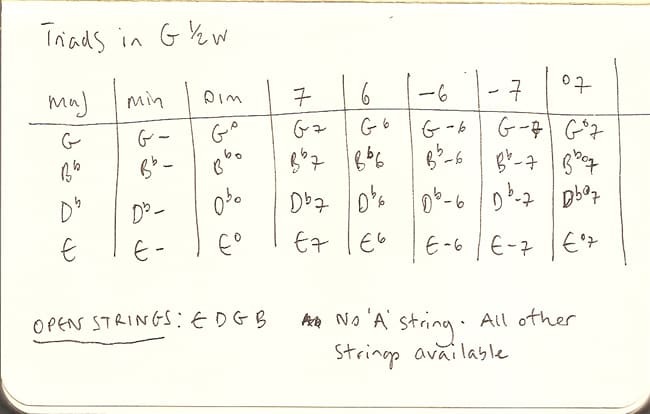 Here’s some harmony from the diminished scale – triads and extended chords that exist within G diminished. In this particular key you have all the open strings available apart from the A string. So you might think about combining the two in some way. For example, play G on the 4th string, 5th fret, and Bb on the 3rd string 3rd fret. Then add in the open B and top E. Now move the G and Bb around in minor 3rds whilst keeping the open B and E ringing. One of the annoying things about working with the diminished scale is that you can get lost in the ‘move things around in minor 3rds’ thing. Now I command you to go forth and find something from this scale! And share that one thing in the comments right here.